I was never a fan of the "creme" inside the egg, though it's a fun idea (the caramel version sounds much better to me). 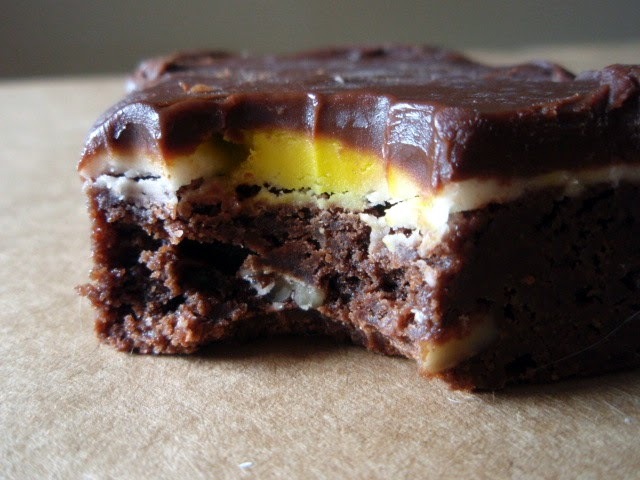 These brownies are inspired by those white-and-yellow-filled chocolate eggs, but the colors and presence of chocolate are where the resemblances end. Instead of using fondant as my filler (there's a reason no one likes to eat the fondant off a fancy cake, folks! ), I used something akin to a buttercream frosting flavored with vanilla. Like the creme in the egg, my filling is surrounded by chocolate--the bottom is a gooey brownie and the top is a rich glaze. Yeah, so my egg yolk and white don't ooze like the Cadbury eggs, but I don't find that appetizing anyway (unless we're talking solely about actual runny yolks, perhaps atop toast...that's a different story). First, make the brownies. Preheat oven to 350 degrees F and grease a 13x9" pan. In a medium saucepan (or in the microwave), melt together the butter and unsweetened chocolate. Whisk until smooth, then let cool for a few minutes. Whisk in the sugars and blend well. Whisk in the eggs and vanilla. Fold in the flour, salt, and almonds, then pour into prepared pan and bake 40-45 minutes, or until edges are beginning to harden. Remove from the oven and cool completely. To make the filling, beat together all of the ingredients except the yellow food coloring until totally smooth. Add more water if necessary to obtain a spreadable consistency. Remove about 2 tablespoons of the filling and color it with the yellow dye. Once the brownies have cooled, spread the uncolored filling over them, then dab on the yellow filling in some random places and smooth each out a little bit. It might look diseased, but trust me, the finished effect is neat. To make the glaze that covers that blotchy look, simply melt the butter and chocolate chips together and blend well, then pour the glaze over the brownies and fillings. Tilt the pan so the glaze coats everything evenly. Refrigerate for a couple of hours until set, then slice and serve! They look good... but I am with you about caramel filled eggs being better. What a very creative idea! These look really delicious and I'm sure they'd be a hit! I choose your brownies over the creme eggs any day!! All taht gooey chocolate vanilla...def hits the spot. I've always found brownies to be a little boring in comparison to other sweet stuff out there.....but this has got to be the most creative brownie I've ever seen! And it sounds delicious too! :) I'll admit I've never actually tried cadbury creme eggs before.....what does the 'creme' inside the egg taste like? Great idea! So colorful and festive. Entirely better than the oozy real deal (which I normally don't like) this one is definitely a vast improvement on the original. I think you've outdone the actual Cadbury egg with these! I don't like the inside stuff either! it's too sweet. and there chocolate:filling ratio is all off. I love you for this Grace! These brownies look so much better than the Cadbury Eggs! I'm afraid that I'd really go overboard with these yummy brownies, but chocolate is healthy-right? I'd take these over a Cadbury Egg any day! (Banging head against wall. ) Why am I allergic! definitely my kind of brownie! A brillant idea! I would love one large slice with my afternoon tea. I don't like eggs filled with cream, but this idea sounds delicious, Grace!Delicious treat! My husband loves those eggs so I know he would be thrilled if I made these for him. I love the play on words in the title. This is a great recipe that I'm sure will taste great. I know...so many Cadbury Eggs everywhere and I couldn't resist....but U really love your Cadbury-Creme-Egg-Inspired Brownies! :) SO pretty! Me encanta …Delicioso y bien hecho…abrazos y abrazos. I did that last year, not this way, but put them in the middle and wow, they were sweet as hell, but delish! 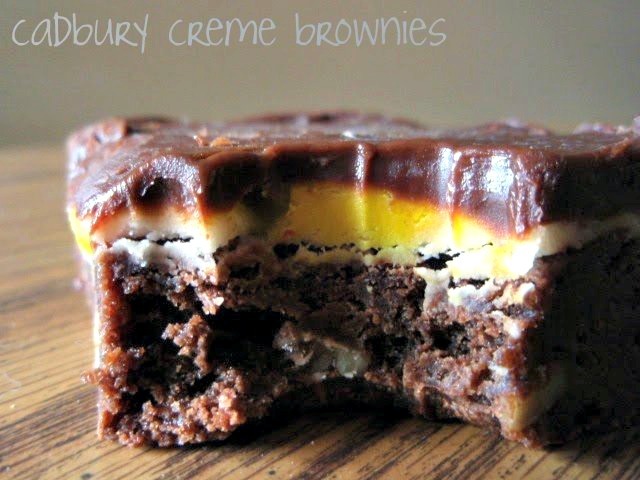 I also like the caramel version more, but I know I would like these Cadbury creme egg inspired brownies even better! YUM! Like the idea of the cream egg in the brownie...looks very tempting Grace. You're not going to believe this, but I've never eaten a Cadbury egg in my life. But these DO look yummy! There's a caramel version? Well, I'd like that even better! So creative! I think I first saw this (or something like it) posted on Valerie's blog, but it's definitely swoon-worthy in every incarnation. Very cool Grace! I'm not a big fan of the cadbury's either, but this looks amazing! Those Cadberry eggs are so sweet they make my teeth hurt, but I still have one every Easter. So in the spirit of Cadberry, I'm sure that I could enjoy a few of these brownies too. I do like the look of these, very creative way to use the creme egg! I have to admit, these look much better to me than the Cadbury Eggs. I like that you have "yolk" in these - very cute. I've never been a huge fan of Cadbury eggs either (although I bought some this year to try again, just in case my tastes have changed over the years), but I would gobble these right up! YUM!